Hailed as a “great day” for Europe, 120 members of the European Jewish Parliament toasted their election with declarations of it marking an “historic event” in which “one assembly standing for one cause” further “empowers” European Jewry. And that Jewish “empowerment” wasted no time in making demands upon the cowering Gentile European majority, (once known as Christendom before Jewry’s onslaught), insisting on the termination of Lady Catherine Ashton as the EU’s foreign minister. AN ALL-OUT JEWISH blood-lust campaign against Baroness Ashton is now armed to the teeth in which the Jewish Parliament is demanding that she either “repent” or “resign.” View Jew Demand Here. The Jewish hysteria centers around Ashton’s comments on April 13 regarding the killing of four Jews at the Ozar Hatorah school in Toulouse France last month. Condemning Lady Ashton for drawing a “despicable” moral equivalent between the Toulouse killings and the Israeli assaults on Gaza, the European Jewish Parliament wants nothing less than Ashton’s blood. 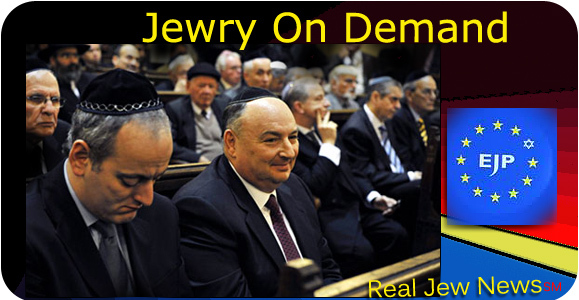 Evidently, Jewry pays no gratitude to those who host their Jewish balls and ceremonies, namely, Brussels, which gave the Jews full use of its parliamentary headquarters on February 17, 2012. Only two months later, the Jews repaid Brussels by demanding it throw its highly esteemed foreign minister into the rubbish heap and flush her down the toilet. SUCH is the manner of the Jew: vicious castigation, arrogance, ingratitude, and overweening hubris. CHRISTIAN BYZANTIUM extended from the Balkans to Western Europe during the 4th through 15th Centuries AD. In addition to being a Christian civilization in which the Church worked in “symphony” with the State, (as today in Putin’s Russia), Byzantium had one further characteristic, namely, its claim to be the direct continuation of the Roman Empire, a claim maintained until its fall in 1453 at the hands of Muslim invaders. 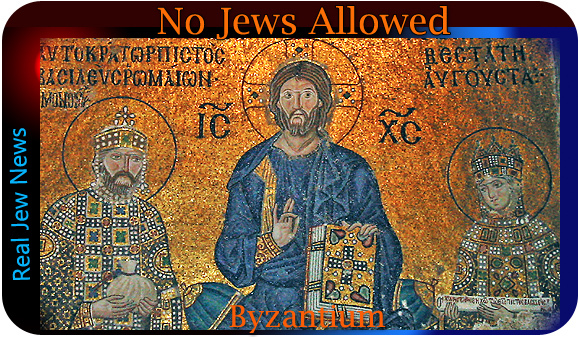 JUSTINIAN’S CODE FORBADE Jews from holding civil office and teaching positions. Even part of the Orthodox Church’s “canon law” prohibited its members from seeking out “remedies” from Jewish physicians. + To engage in proselytism; + To marry Orthodox Christian women; + To possess Orthodox Christian servants; + To hold office or honors in the Roman state; + To build new synagogues; + To read the Old Testament in Hebrew but rather in Greek which did not cut out the prophecies that pointed to Jesus Christ; + To use Judaic interpretations of the Old Testament; + To bear witness in court against an Orthodox Christian; + To hold teaching positions in Roman schools or as private tutors. 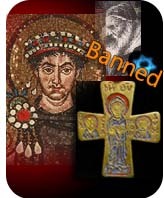 The culmination of Justinian’s “Codex” was the denial of Roman citizenship to the Jews and relegating them to the rank of second class citizens. 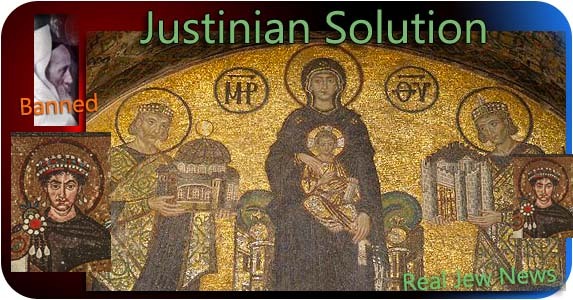 In spite of Jewry calling Justinian an “anti-Semite,” the Orthodox Church not only honors him as a great Emperor but also as a great saint. View Entire Prohibitions Here, Here, Here & Here. THE SOLUTION TO THE JEWISH PROBLEM is for Europe to return to its Christian roots—the historical Church—in which the “evangelical” error that posits the Jew as “chosen” and having some “special” role to play has no place. Neo-paganism and idyllic myths that salivate over Indo-European “gods” promoted by White-Identity Websites will only provide the Jew with yet another stepping stone to greater hegemony over the political affairs of European society. Wagner (a profound master) and his operas indeed are milestones in the evolution of classical music. But to elevate Wagner’s Nordic Wodens and Fricas to realms of some new European “reformation” is not only laughable but historically shallow. 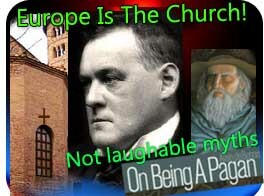 “Europe Is The Church and The Church Is Europe!” said the great 20th Century historian, Hilaire Belloc. It is via the historical Church, and ONLY the historical Church, that the Jewish siege of Europe can be opposed, dismantled, and ultimately destroyed. 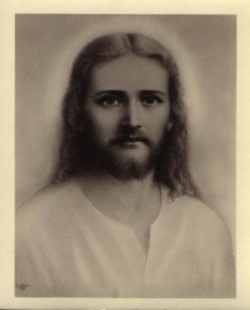 [Ron: Actually Judaism can only be destroyed by humanity embracing Christ consciousness which is not the exclusive domain of ANY church or religion. ].